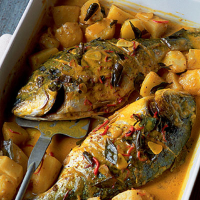 Gilt-head bream is a well-flavoured fish that can take a good rich, spicy sauce. If you prefer, ask the fish specialist to fillet the fish for you and serve two fillets, placed one on top of the other, per portion. Preheat the oven to 180°C, gas mark 4. Cook the potatoes in lightly salted water for 8-10 minutes until only just tender. Make deep scores into the flesh on either side of the bream and rub with a little salt. Leave to stand for 15 minutes. Heat the oil in a small frying pan until hot. Add the curry leaves and fry for 1-2 minutes until they start to darken in colour. Remove and drain with a slotted spoon and reserve. Add the cumin, coriander, garlic, chilli, ginger and turmeric. Fry for about 1 minute. Stir in the tamarind paste, coconut milk and a little salt and bring to the boil, stirring constantly. Lay the fish in a large, shallow ovenproof dish. Brush a little oil under the fish tails to stop them baking onto the dish. Scatter the potatoes around the fish and spoon the sauce over the potatoes and fish. Bake for about 30 minutes until the fish is cooked through. Serve scattered with the curry leaves, with a pack of warmed Waitrose Indian Bread Selection for mopping up the juices, and a bowl of tamarind chutney.